Munsey really is just tooting his own horn in his “Publisher’s Desk” column inside the March 1898 issue of his magazine, but his first person account of why his magazine, Munsey’s Magazine, is the best magazine is addressed to the reader in such a personal way that the writing style doesn’t feel much different than the dozen of blog posts I’ve already read today. He spends two entire double column pages explaining why Munsey’s Magazine is the superior monthly, even including the comparative chart reproduced on this page below to show why Munsey’s is superior to Harper’s, Scribner’s, Century and McClure’s Magazines. Munsey’s editorial contains four sub-headings. Surely if Frank Munsey were around today he’d have easily managed four separate blog posts out of these, but as he only had a precise amount of space on a timed monthly basis the wealth of content is understandable. Munsey begins his commentary by quoting a paragraph from The Albany Express which complains that magazines have a greater regard for their advertisers than their readers. The way the pages were cut in a recent issue of McClure’s is given as a prime example of this position. See, way back when, not only were magazines printed on paper, but the pages which comprised an issue were not always cut. The reader would have to separate the pages themselves with a knife or other sharp edged device in order to completely page through the issue. The Albany Express has noticed while most editorial matter is left to the readers to cut that the pages containing advertising are on leaves which are already cut for them. The pages of Munsey’s Magazine are cut, and it is the only magazine in the world whose pages are cut. In this, Munsey’s Magazine leads off again. He writes that when he first brought up the idea of cut pages he was told it couldn’t be done. As time passed on he felt the market demanded cut pages and if demand was there a solution could be had. Plans were submitted and machines were built. They were installed several months ago in our printing plant, and since then the pages of Munsey’s Magazine have been cut–not trimmed. He makes the distinction between cut and trimmed by noting that it would have been much easier just to chop the edges off the pages to make each issue entirely uncut. But that’s not The Munsey’s way, the pages were each sliced along the uncut edges rather than trimmed off. Munsey then points to the chart and especially picks on McClure’s noting that they only have about half the editorial content as Munsey’s at the same price. The Munsey is the same size as the thirty five cent magazines. It is as big as the biggest, and has a heap more variety in it. The discussion then turns to subscription numbers and Munsey talks about sustaining quality on their climb. Sometimes it is thought a thing can be made too good; sometimes it is said to me that the people don’t appreciate the fact that we are giving so much more for a dime that anybody else is giving; sometimes it is said to me that the people don’t know whether we give a ninety six page magazine or a hundred and sixty page magazine–that The Munsey would have just as big a circulation at half the size. The policy of this magazine has been to give more and more, and always more, for the money. The same policy will be continued throughout this year and the coming years. This is where Frank Munsey gets as personal as possible. He’s pledging to gain as many readers as he possibly can with hopes of being the first magazine to a circulation of one million. He really wants this and ends the section by putting his money where his mouth is. We should like to reach the million point, but can we? How can it be done? Is The Munsey good enough to command a circulation of a million? If not, how can it be made good enough and still keep the price where it is today? There are a good many questions that the publisher can’t answer satisfactorily to himself. Imagination doesn’t always carry accurately. Munsey then declares that he’s willing to spend $250,000 over the next year if that expenditure can be made to push circulation to a legitimate million copies per month. Legitimate in that no “inducement schemes” are offered, legitimate in that the subscriptions be purely on the merit of the magazine itself. This is a problem that some great genius may be able to work out successfully. If it is worked out, however, it is far more likely that it will be done by the combined suggestions and personal influence of our readers. Munsey writes that besides their busy subscription department, advertising in The Munsey has also flourished over the past year with an increase of 20%. The reason is elementary: Advertisers won’t get a better return on dollars spent than they will in The Munsey. Wide awake, up to date people, people who have money to spend, and spend it with first rate intelligence. These are the people the advertiser wishes to reach, and they are the people he can reach through Munsey’s Magazine. 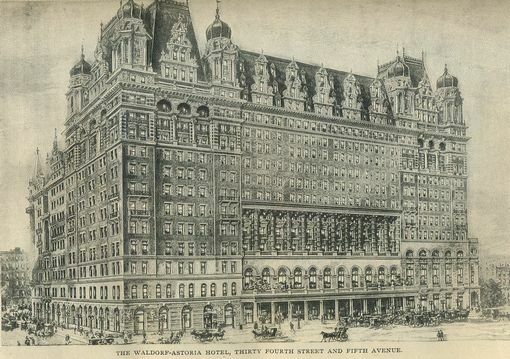 Munsey brags about his magazine reaching across the entire continent, “From the Atlantic to the Pacific,” and then says that advertisers cannot afford not to advertise in The Munsey. The modern way of doing business is to do a big business, and to do a big business one must reach out across the continent–reach out to the millions of money spenders. In two pages Frank Munsey makes his case for Munsey’s Magazine as the most technological magazine publisher by way of his specially commissioned machine. He uses statistics to prove that Munsey’s has the highest quality content, or at least the highest ratio of content to advertising. He reaches out to every reader basically attempting to crowdsource ideas for reaching his circulation goals. He doesn’t present the quarter of a million dollar offer as a prize, instead he just states that he will spend that much in total towards the goal. Finally he tells the advertisers that they won’t get more bang for their buck anywhere else. Munsey’s Magazine actually began as a weekly and it was failing. 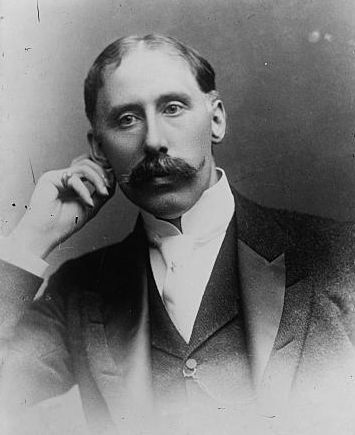 At the time of the 1893 panic Munsey was $100,000 in debt (Peterson 9). How’d he turn it around? He executed a brilliant idea and then, contrary to what he says five years later in our 1898 article, he advertised it. He changed Munsey’s Magazine from a weekly to a monthly but most importantly slashed it’s price from 25¢ to 10¢. He ballyhooed the move with, of all things, an advertisement in The New York Sun, which worked. Peterson explains Munsey’s masterful stroke: “Once could achieve a large circulation by selling his magazine for much less than its cost of production and could take his profits from the high volume of advertising that a large circulation attracted” (8). Munsey’s circulation skyrocketed from 40,000 copies sold of the debut 10¢ issue in October 1893 to a half million by April 1895 (Peterson 10). Peterson then mentions Munsey’s boasts from our April 1898 issue and adds that by 1901 Munsey was claiming twice the circulation of Century, Harper’s and Scribner’s combined! Munsey’s Magazine began the century strong with Munsey claiming top circulation in a 1907 speech, but by the 1920’s circulation had plummeted to just 60,000. Munsey himself died of a burst appendix at the end of 1925 and by 1929 Munsey’s Magazine was merged with another of the publisher’s titles, the Argosy. I’ve begun at least browsing the eBay magazine listings pretty heavily again. There’s still some pretty interesting material available on the site, but the category has seemed to become a lot more professional in the past few years. Highspots are now recognized. I remember back when I first bought the Russell & Russell Guide in 2005. I quickly made a tidy little sum just seeking out the single magazine titles they pointed too. Nobody overlooks original Salinger fiction in old issues of the Post or Collier’s anymore. In fact, most single issues of the Post and Collier’s seem to be priced as though there’s Salinger inside every one! Niche titles are no longer undervalued. In fact, they’re overvalued. Somewhere along the lines the mass of sellers came to realize that all it takes is one sucker. (Think baseball free agency.) If there’s one guy online looking for a title on, I don’t know, say a focused science or nature title, then he may as well pay $200 for 20 issues the same as he used to pay $20 for the same lot. Quality lots have decreased. In all ways. Either the condition ranks right there with magazines I’d throw out myself, or the titles are undesirable. I gave up my hopes of finding a mid to high grade lot of 1930’s Saturday Evening Post at a bargain a long time ago. I never thought I wouldn’t be able to find a complete set of, oh, 1980 Time Magazines for $50 or even $100 bucks, but I can’t. If you’re looking for lots of National Geographic or old sewing journals though you’ll be pretty happy. An increase in Bound Volumes. I expected this at least, though I don’t know how many “lots” or “complete sets” I have clicked on only to discover that it’s a bound run of a title. And see point 1 on these, highspots are recognized, so there’s really not even much of an opportunity to log into eBay and steal some 19th Century bound Mark Twain runs for a few dollars anymore. I suppose each of my four points could be taken as sour grapes to some degree, as 4-6 years ago I was taking advantage of all four of these unrecognized points in the market myself. I was the guy buying unrecognized highspots, niche titles, undervalued bound volumes and putting a retail price on them; I’d hunt the quality lots at $2 per issue and mark them $10-$20 per issue. And they sold. But the purpose here was to point out that these opportunities have become much harder to spot. Usually these opportunities will be offered by the part-time or amateur eBay seller, though I haven’t come across a tremendous amount of those in my recent searches on the site. I get emails and phone calls from people looking to sell their old magazines several times per week. Typically it’s exactly the stuff you’d expect someone to have saved: 1960’s runs of Life Magazine and National Geographic are the commonly cited goods. I know what’s happened by way of fielding these calls and e-mails: eBay has become too complicated to sell on for those just starting out. I feel lucky to have signed up back in 2000 as that was a time you could just throw a not very good description up with photos being an option, not a necessity. I was able to learn and evolve slowly over the past decade to the point where I get thrown off trying to list on other sites, even when they have an admittedly simpler process. Over the past few years changes in the eBay fee structure has made it possible for professional sellers to list Fixed Price goods at a very cheap cost. It’s also made it possible for amateur sellers to list 50 free auctions each month, regardless of the value of the minimum bid. By reducing the risk to selling on eBay the site has significantly raised the cost for buying. Professional sellers pay a small fee for an ad. They spread as many ads onto the site as they possibly can. The investment per listing is small enough where if a single item does not sell it doesn’t matter too much. Thus why not ask what you want … plus a little more. Amateur sellers are only investing their spare time to list 50 items per month. If something’s been sitting in the house for 20 years they may as well put it up for sale at the price they want. Despite the times there doesn’t appear to be any urgency to sell. Auctions of fine goods still recognize fine prices. No bargains there. Auctions for junk still deliver junk at a bargain. Being offered by a seller who actually wants to sell. The current trend I’ve seen in Offers from buyers is a 50% opening offer. The sweet spot where a deal is agreed upon seems to be somewhere between 60-80% of the full marked price. When offers of 50% and under used to come in I’d shake my head because I’d never imagine making such a low offer myself. I’d be insulted and make the mistake of taking it personal, at least for a few moments. But guess what? It works. Some sellers actually take half and leave me wondering if I should have offered a quarter. A heavily illustrated article inside the March 1898 issue of Munsey’s Magazine caught my eye so I’ve scanned all of the images to share with you here. 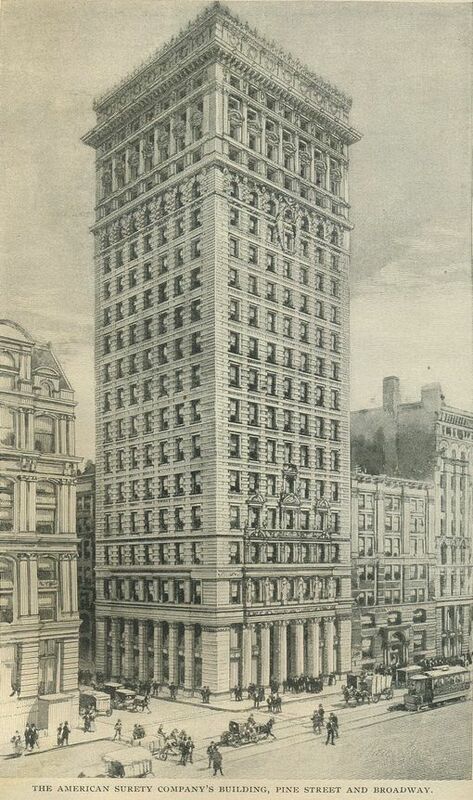 The unattributed article is titled “The Tall Buildings of New York” and goes on to talk about early skyscrapers at a time in which there was great wonder at the rapid progression from the 10 story skyscraper to those of 20 to 30 stories in height. 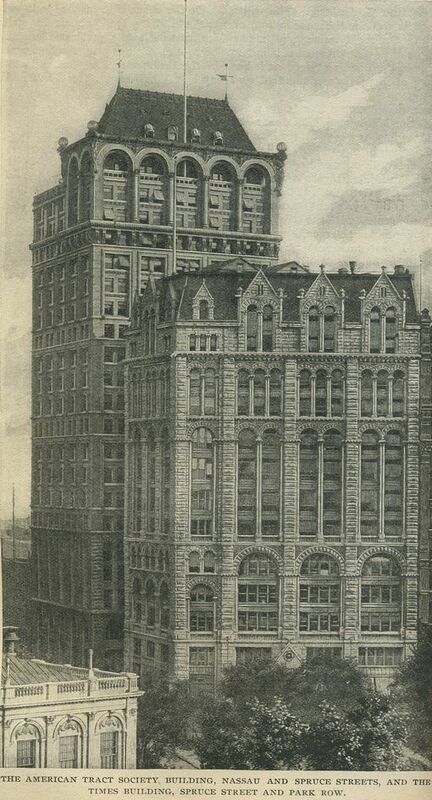 While the article concedes Chicago should be credited with the first of the skyscrapers in the 10 story Home Insurance Building built there in 1885, it concentrates on New York because the skyscraper had become imperative to the city’s continued growth. Towards the close of the 19th Century, New York was simply running out of room. 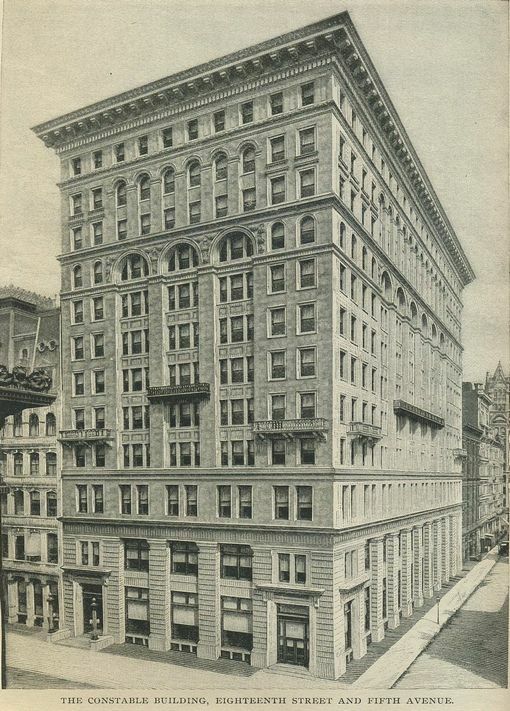 According to the anonymous author “predictions were freely made that the days of New York’s supremacy were numbered.” The demand for space had grown to such a degree that rent became prohibitive and businesses turned to other locations. 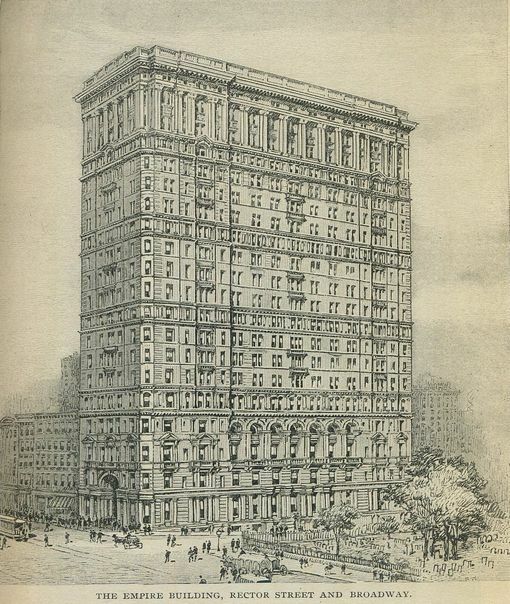 The 1898 article comes at a time where the skyscraper has only recently established its place in the American imagination. In the skyscraper “modern architecture has evolved its first great distinctive type,” comparing it to the tombs of kings constructed in Ancient Egypt and the gothic cathedrals of Medieval Europe. 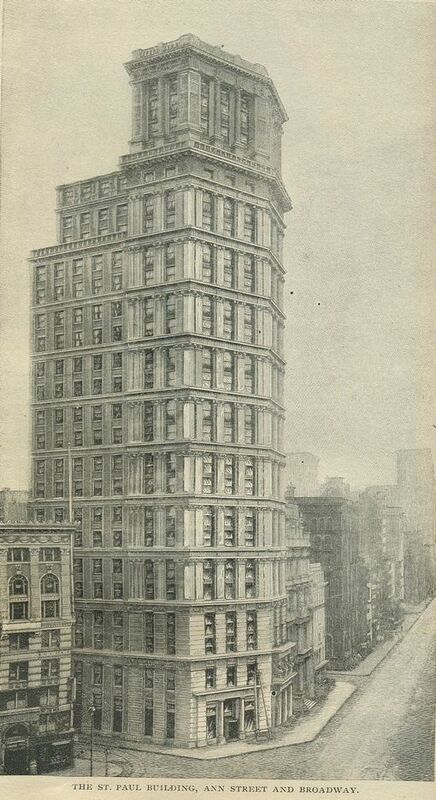 People used to seeing buildings erected one floor at a time, one on top of the next, stopped in wonder as the building process reversed itself before their eyes. Now the first thing they saw were steel frames stretching into the sky; masons and bricklayers only showed up to ply their trades afterwards. Until the development of the steel frame method buildings other than simple towers or spires could only stretch 8 or 9 floors high at most. The weight of higher levels made going any higher prohibitive. 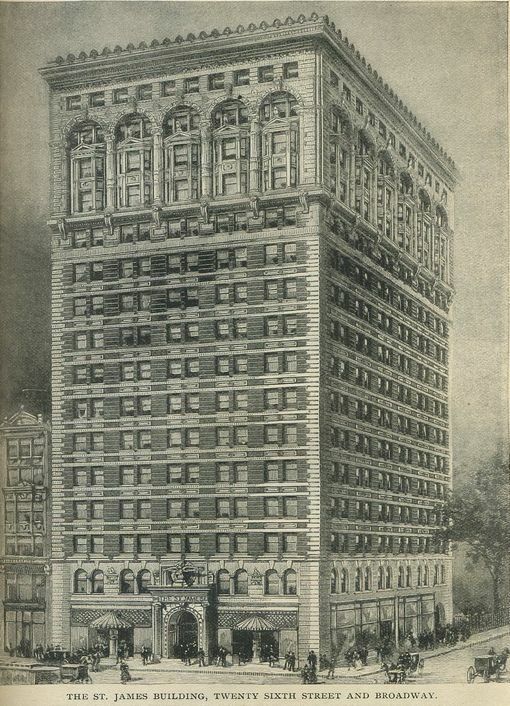 The Bowling Green Building, 11 Broadway. 16 stories with frontage over 120 feet. Built by W. and G. Audsley. The white granite the same used at the Grant Monument. 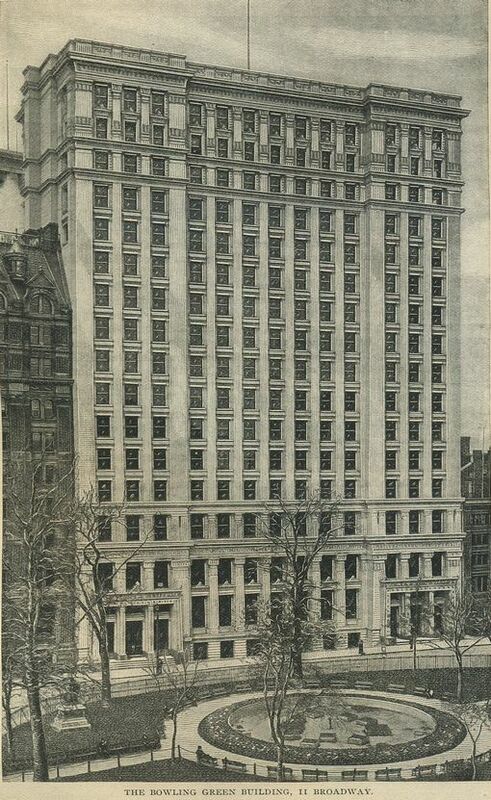 The Manhattan Life Insurance Company Building, 66 Broadway. 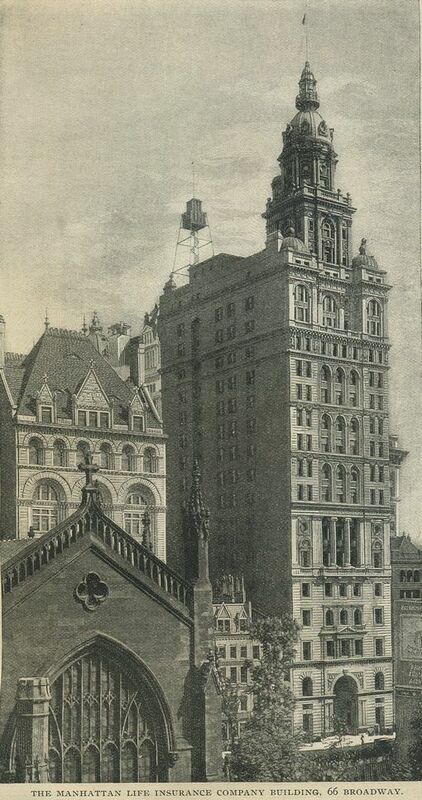 348 feet high, at the time only the twin spires of St. Patrick's Cathedral was higher from the sidewalk. 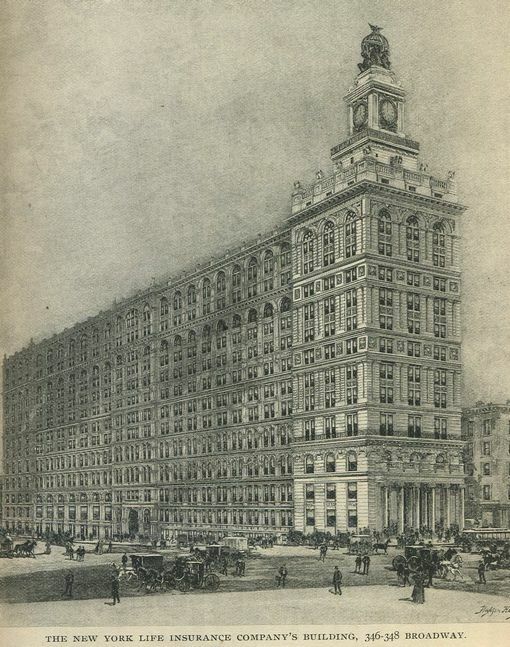 Architects were Kimball and Thompson who also did the plans for the new Standard and Empire buildings shown on this page. 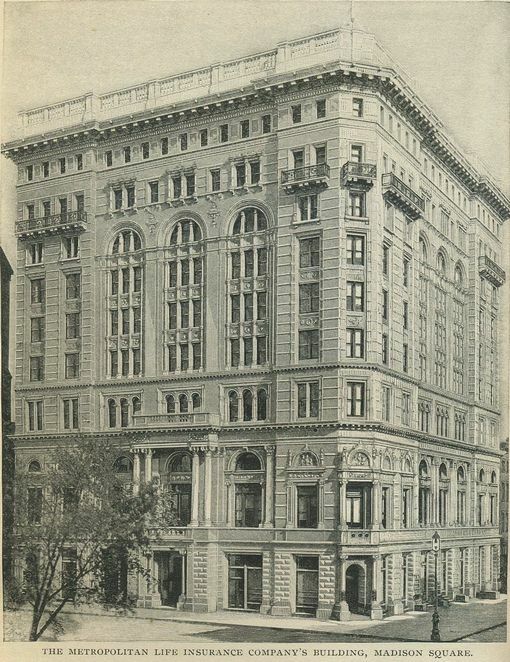 The American Surety Company's Building, Pine Street and Broadway. 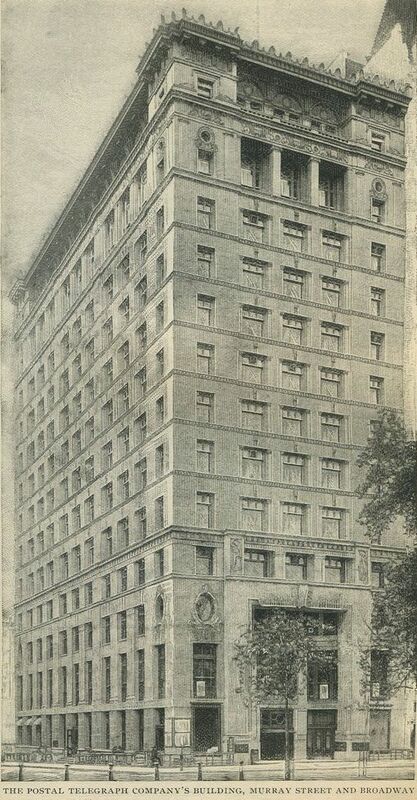 A great white building with gilt coping, named in the article as possibly the most artistic office building in New York. 308 feet high and visible from miles around as far as New Jersey and Long Island. Built by Bruce Price; Sculptor Massey Rhind helped to beautify it. 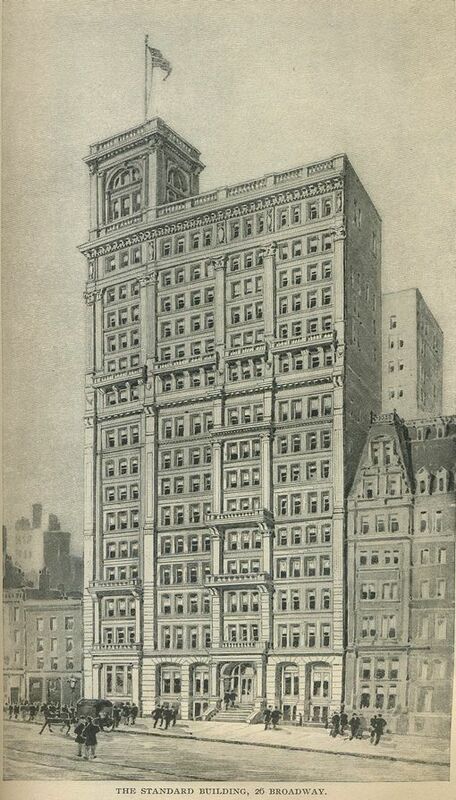 “The Tall Buildings of New York.” Munsey’s Magazine. March 1898: 833-848. This was a bit of a shocker. Dr. Steven Lomazow, author of the comprehensive American Periodicals: A Collector’s Manual and Reference Guide and highly entertaining Magazine History: A Collector’s Blog, has made his magazine collection available for sale. Dr. Lomazow notes “Serious inquiries only, we are talking a price (on request) well into seven figures.” I don’t know how widely the doctor would appreciate his email address being published around the web, so I will direct you to his post announcing the sale and point you near the bottom of his text to locate his email address. Besides his wonderful blog and his hardbound Collector’s Manual, which is perhaps the most valuable of all resources to magazine collectors, Dr. Lomazow includes several free online magazine collecting guides in his sidebar. One example is his Complete Movie Magazines Guide, 1909-1940, while other free guides include Radio and Television and Early Literature in magazines. Dr. Lomazow, a neurologist, along with journalist Eric Fettman published FDR’s Deadly Secret , a work which uncovers previously unknown details of Roosevelt’s poor health, in 2010. When Dr. Lomazow’s Magazine History blog first appeared in January 2008 I was taken aback by the content. The reason my own site came into existence was that there was previously very little information available online for magazine collectors. As he exposed his wide collection I became so absorbed with Dr. Lomazow’s site that I’m afraid I neglected this one. I can only hope that once his collection sells Dr. Lomazow will continue to occasionally update his Magazine History site with his collecting experiences. I’ve been at this little project for awhile. These articles have been tucked inside a far away corner of Immortal Ephemera for a few years now, though prior to that they did at one time have their own home. I wouldn’t imagine that the classic movie fans and collectors who visit Immortal Ephemera regularly were even aware of the presence of Collecting Old Magazines, but it was there. Traffic was good, mostly organic through Google, and so once I realized that my hosting plan allowed me to host an unlimited number of sites on the same dime (thank you, Dreamhost! ), I decided Collecting Old Magazines was well worth snapping off and placing on its own piece of web real estate once more. The bulk of the heavy lifting which comprises the articles that make up Collecting Old Magazines was work I originally did between 2005-2007. Don’t let the dates worry you, it’s strong evergreen content. After all, the history of Life Magazine or the Saturday Evening Post haven’t changed too much in the passing years. I can look inside a January 30, 1904 issue of Harper’s Weekly to relive their original presentation of the Wright Brothers’ first flight just as well today as I could back in 2007 when I first posted that article. Collecting-Old-Magazines.com launched back in 2005 hosted by a platform called SBI! It was pretty cool at the time as I really didn’t know how to build a handsome looking site on my own from scratch and my early experiences with WordPress 1-point-whatever assured me that I’d never be a blogger. Toying around SBI!’s back end finally taught me html and I found myself moving from Immortal Ephemera’s then FrontPage2000 construction over to html by my own hand. From there I cancelled my SBI! hosting to save money and moved the magazine site over onto Immortal Ephemera circa 2007. In 2009 I learned that WordPress 2-point-something was a lot easier to work with than that 1-point-whatever and by 2011 WordPress 3-point-now is beyond what I ever would have imagined. And so CollectingOldMagazines, sans hyphens, makes the move back to its own home. Will I be posting a ton of new content here? I can’t say so for sure at this time though I will say that I still buy and sell old magazines and so by relaunching this site I now have somewhere to write about them again! And so that is something I imagine will naturally happen. For now, the next step is to find all of the non-movie magazine related content still posted to Immortal Ephemera via WordPress–it’s there–and move that over here. That’s content that was never part of the original hyphenated magazine site but was posted to my classic movie themed site post-2009 after I began switching everything over to WordPress. Once that’s all up I expect to post something new to this space every so often, even if it’s just bragging about some new arrivals. Hope you enjoy, I’m excited to have the site back up on its own two feet!